The following video provides a deep dive into what it happening with the Chinese economy and how it will impact the rest of the world. Richard Duncan is one of my favorite economists. His books transformed the way I think about the global economy and financial system. The Stock Market "Always" Bounces Back, Right? A financial advisor makes their living by keeping as much of their client's money in the financial markets, at all times. They charge fees to manage clients money, manage mutual funds which charge fees, or both (they charge a fee to pick specific mutual funds their company owns which also charge a fee). If a company makes 1% on their AUM (assets under management), then their bottom line looks much better if their clients have $100,000,000 invested vs $50,000,000 invested. Therefore, it is the responsibility of the financial industry to (1) create narratives that explain why investors should always have money invested and (2) create a reason why they should use their company to invest the funds. 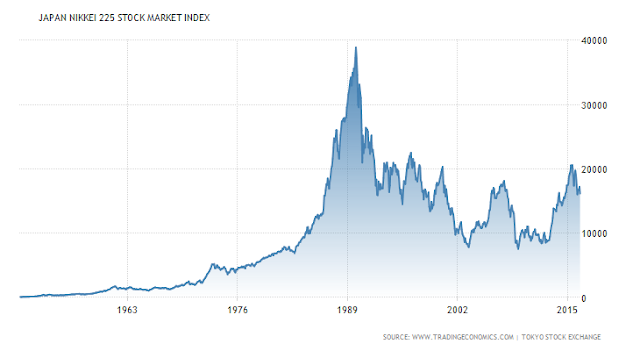 One of the more popular stories you hear is; "do not worry, if you invest in the stock market, even if it at a peak in the market cycle, the market will always return to new highs and you will collect dividends along the way" (as long as you do not panic during the decline, pull your money, and stop the 1% gravy train of investment fees flowing to my company). The part in parenthesis is usually left out. Another fact usually not mentioned is markets can take a very, very long time to return back to their previous peak. In some cases they may never return again in the investor's lifetime. 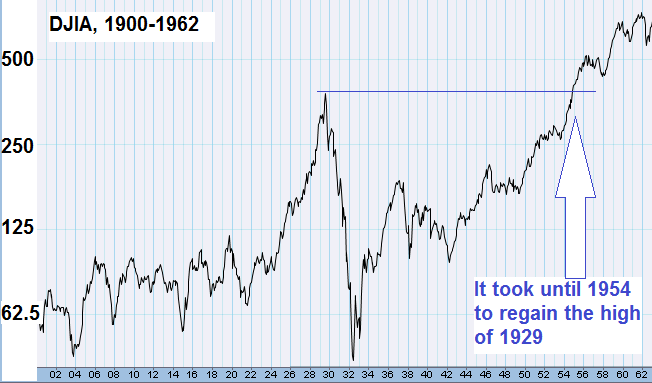 The DOW peaked in 1929, fell 89% and then took "only" 25 years to recover the losses. It should also be noted the DOW shifts the companies in the index. Some of the stocks in a market index can go bankrupt, which means they can never return to their previous highs. The Japanese market peaked in 1989 and is still well below the peak 27 years later. Some Japanese investors who purchased or held stocks during the late 1980's may not see their capital returned whole in their lifetime. Make sure you know how someone makes their living before you put 100% of your faith in their investment advice. For example, if a company makes 0.0% on the funds you hold in cash, precious metals, and residential real estate, how will that impact their investment advice? There is a reason advisors suggest holding a portfolio structured as some form of X% bonds and X% stocks; they make money on 100% of the portfolio. The same applies for other markets as well. If you ask a real estate broker if you should use $60,000 as a down payment to purchase a home or put it in the stock market, how are they likely to respond? How about a company that sells precious metals? As you can probably tell, I do not work in the financial services industry. I work in the commercial real estate industry, and writing here is a hobby, not a job or a way to sell investment products to a client. Unfortunately, most of the financial market information you find online is presented by companies that have a vested interest in keeping a bullish undertone (there are very few weird people like me who write just because they enjoy it).